In the late 1890s, a cold, frozen territory of the Earth revealed its undepletable deposits of humankind’s much appreciated yellow source of delight; gold. Thus began the infamous Gold Rush in the territories of Alaska and Yukon which continues to tease the imagination of romantics with a taste for adventure. The prospectors went down in history as heroes and so did the dogs serving them. The series that is about to begin below will provide some insight into this glorious past which, at times, was in fact not so glorious, and it’s perhaps fair to think it has only been varnished by time and distance. It’s an old cliché that even the first ‘conquerors’ of the New World, who crossed the Bering strait, i.e. the Paleo-Indians had a single domesticated animal, a hunting companion and occasionally, a source of food: the dog. Centuries and millennia passed, and the dog remained man’s sole help for work in the far North. Its size and build changed with every territory; Yupiks and Inuits at the western shores of Alaska used different dogs from those used by the Atapasque Indians living further inland. Their function and their tasks were similar though. In the winter, they would draw sleighs and were used for carrying loads in the summer. Dogs were ubiquitous at the time European and American fur hunters and gold prospectors began to appear. White man soon discovered, that in this inclement and unfriendly environment, a good dog is an indispensable companion. In 1896, when the gold deposits of Klondike were discovered, the value of a good sled dog was multiple times of an ordinary animal further to the south. While the price of a dog would be $15 in Seattle, Washington, the same animal in Skagway would sell for tenfold that price. Several tales, stories and legends were born of the dogs of the north. Buck, White Fang and their companions who had inspired Jack London, Robert Service and Oliver Courwood were often based on real-life events, sometimes more exciting than invented stories. Let us now take a closer look at this bygone world, and learn of the stories of those people and dogs we today only know from yellowed photographs and the pages of old, dilapidated books. Allan Alexander Allan, the Scottish adventurer, aka Scotty Allan was a mushing legend, yet he is almost completely unknown to us. Scotty Allan, the king of the paths of the north, was born in 1867 in Dundee, Northern Scotland. At a young age, he trained horses and herding dogs. He was not yet 20, when he won the Grand National Sheep Dog Trial with his Border Collie. In 1887 he travelled to the United States, accompanying a group of Clydesdale stallions. Having delivered the horses, he decided to try his luck in the New World. Working in various occasional jobs, he gradually progressed westward. He reached Klondike with his young wife and their two-month old infant in 1897. Being an expert with dogs, he soon found the job that suited him the best: he became a mailman. In the northern regions, this meant thousands of miles that had to be covered on dog sleds, carrying packages, letters and information, while often having to endure inhumane conditions. Official parcels had to be carried in snow and ice, even in biting cold temperatures under -50 °C. In 1900, gold deposits even greater than those in Klondike were discovered in the western coastal areas of Alaska. Before long, 100,000 people were bustling about on the sand dunes that had been lifeless and frozen until that time. A large camp of tents grew out of the ground in a matter of short weeks which then gradually evolved into a real city. No one named it; they first called it No Name, which later got abbreviated into Nome, the name it is called by right up to today. Huge gold deposits were unearthed here, making a number of people wealthy who would go on to define the history of the 20th century. Scotty Allan also came to Nome with his family, and as a dog musher, he soon found work at Darling & Dean Hardware Co. He quickly became a legend as a fanatic dog musher, audaciously facing any foe or danger. He would unhesitatingly cover even 100 miles, just to deliver a single telegraph. 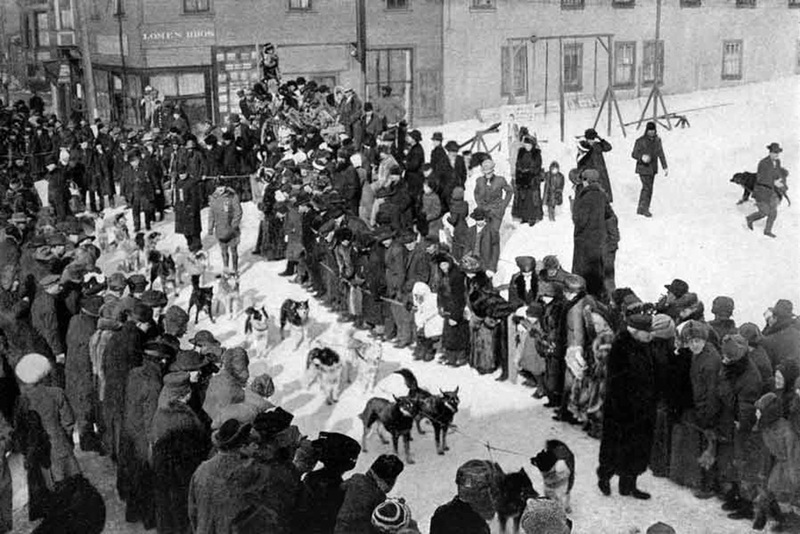 In 1908 Albert Fink from Kentucky established the Nome Kennel Club, which was the world’s first professional dog mushing organisation. The founder used to breed horses in Kentucky, and had devised a typical dog sled sweepstakes, based on the example of the Kentucky Derby. This race is the All Alaska Sweepstakes. The sleds ran from Nome to Candle and back, covering a distance of 408 miles (~660 km). The first race naturally saw Scotty among the participants, with his John Berger dogs. He finished second, which infuriated him. The following year, he participated again with his Berger dogs. 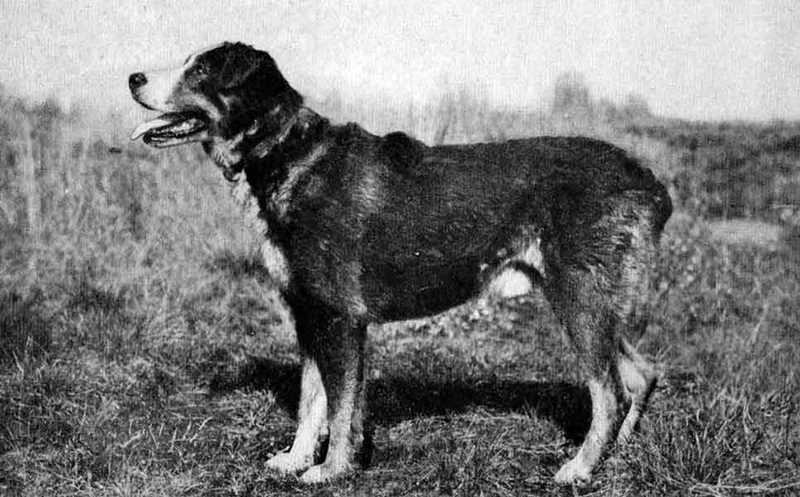 His new lead dog was a large, spotted mixed breed (husky-hound, a hunting mixed breed) named Baldy. From that moment, their lives were closely intertwined. To everyone’s surprise, the 1910 race was won by Fox Maule Ramsay, with his small sled dogs imported from Siberia. Scotty prepared for a year for the next challenge with his mixed breed dogs, and the results justified his efforts. In 1912, he won the Sweepstakes for the third time. In the fourth race, Scotty was mushing his own dogs, jointly establishing a kennel with the famous writer and poet, Esther Birdsall Darling. For posterity, the authoress wrote a novelette titled Baldy of Nome. Even as a puppy, Baldy demonstrated exceptional capabilities, and it was no question he’d once be a lead dog. Whenever not drawing, he was exceptionally calm, almost on the verge of stoicity. Harnessed, however, Baldy being the boss was clear for the entire team, just as Scotty was Baldy’s only ‘god’. 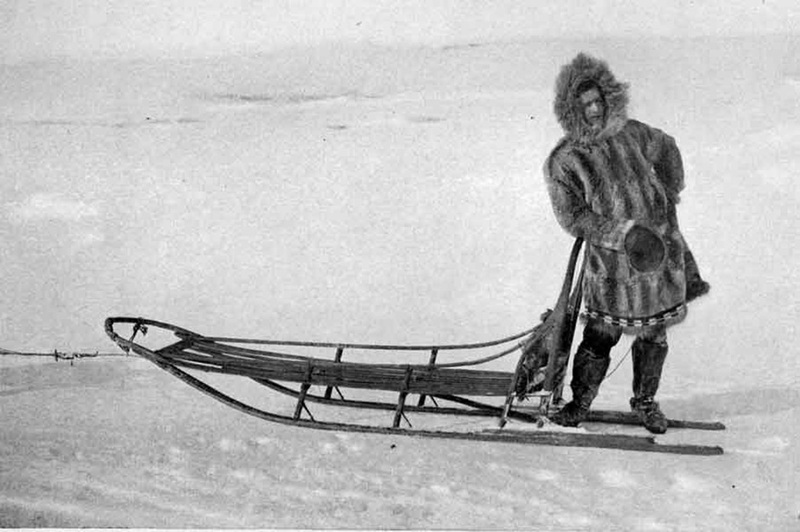 Contrary to many other mushers, Scotty loved to mush in stormy weather, and Baldy would not miss a single of his master’s soft whistles even in the harshest wind. Scotty Allan had imported his practice of commanding his dogs with soft whistles from Scotland, and firmly believed that one must not shout to dogs; one must make oneself understood instead. He was a vain man and had great bodily strength, but only grew to a height of 160 cm, which greatly disturbed him. He loved hats, and felt he’d have a more impressive presence wearing one. He could often be seen stalking the muddy main street of Nome, proudly sporting his hat of the day. The history of Sweepstakes ended in 1917, with the United States entering World War I. However, it opened a new chapter in the lives of Scotty and Baldy: Lieutenant René Haas contacted him on behalf of the French Army with the secret mission of training sled dogs for them. The dogs were mainly required for back up logistics operations, as they managed to work easier in deep mud than mules and trucks. Scotty Allan collected 106 dogs from Nome, and a further 300 from Québec in Canada. Scotty’s main partner in training the dogs was Baldy, who showed everything he had already learnt to the others. The training was an excellent success, and the more than 400 dogs performed outstandingly in the Ardennes and the Alps. When this work was over, Scotty moved with his family and Baldy to Juneau, Alaska. A few years later, they moved to California from there. Baldy lived out his old days with a female dog named Laska, in a huge mansion surrounded by vineyards and orange groves. Upon request by the United States, Scotty Allan trained the dogs for Admiral Richard Byrd’s 1928 Antarctica Expedition. The dogs that returned from the expedition were given to Eva “Short” Sheely in New England. Scotty helped her create a modern breed, which came to be known as the Alaskan Malamute. Scotty Allan died in California in 1941.